This heavy action Daiwa DF100A Giant Spinning Reel definitely offers way more bang for your buck. Because of the DF100A Reel's large line capacity, it's the perfect size left hand retrieve reel if you’re going to battle a large catfish or when saltwater fishing from a pier or beach. The stainless steel main shaft and lightweight aluminum spool are fully anodized for superior corrosion resistance. Weighing just 30 oz., the metal reel features durable metal gears, multi-disc drag and an efficient 1 stainless steel ball bearing system. "I took a chance and bought this reel "sight-unseen" for a 16' New England Surf rod I'm putting together. It's not fancy or frilly - doen't have a lot of "bells and whistles" - no trendy "weeney wage" label. " "this is a great reel when i surf fish because it holds a lot of line and it's powerful"
"Great reel for the money. I always had good luck with Daiwa reels. 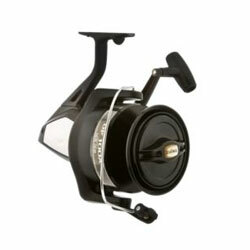 The DF100a is a very large reel, just right for a 14' surf rod."